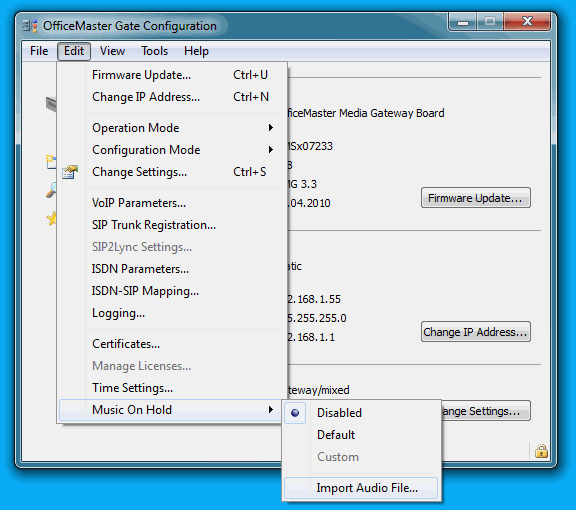 The OfficeMaster Gate products from Ferrari electronic AG support that by default. The gateways include a built-in music which was especially designed and licensed for that purpose. Administrators can disable it or replace it by an individual MOH file. The size of this file is only limited by available mass storage space – the small 4BRI box and the PCIe gateway board in the Survivable Branch Appliance (SBA) both use a 4GB memory card for operating system and data. Typical available space is 1-2GB which could be used for a MOH file. The 1U gateways with 4 or 8 PRI use conventional hard disks so there is even more space available. This entry was posted in Lync, SBA, Survivable Branch Appliance (SBA), Uncategorized. Bookmark the permalink.